ABC: The mouse tries to kill himself by dropping an iron on his head. Sylvester saves him but the iron falls on head in the process. This entire scene was excised from this cartoon. Merrie Melodies: The firing of Bugs' carrot pistol on Rocky and Mugsy was excised, as too was the scene of the two criminals trying to, "...let (Bugs) have it," with gunfire in the darkness at the food processing factory. WB: A man goes into a telephone booth and says, "Operator! Operator! Quick! Get me the police!" The operator tells to him, "Just a moment, pl-e-e-ase!" The telephone booth (and the man) are both split in the middle by machine gun bullets. The bottom of the telephone booth falls to the ground (the top half remains in mid-air), and the operator says to the man, "Sorry. You've been disconnected!" All that was shown of this was the man entering the telephone booth and asking to be in communication with the police. WB: The entire part with, "Only a rat would shoot a guy in the back," was gone. ABC: Most of the part where Elmer is shooting his rifle at Bugs in the swimming pool, was cut, and some of the bullets shot at Bugs by Elmer after Bugs dances ballet were eliminated. 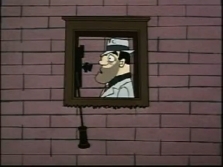 In 1998, another scene was deleted, particularly that in which Elmer lifts a barbell, crashes through the floor of his penthouse and onto the head of his burly neighbor, and the neighbor wraps the barbell around Elmer's head. 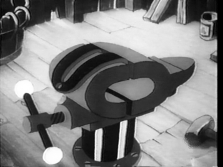 Nickelodeon: In the computer colorized version of this cartoon, the blacksmith puts the rubber horseshoe in a vice. As the blacksmith tightens the vice, the entire scene shakes because of the rubber texture of the horseshoe. Cut was the next part in which the blacksmith pulls out a gun and shoots the horseshoe. WB: In both "A Kiddie's Kitty" and "A Waggily Tale", a scene in which an animal character (Sylvester, Junior as a dog) is thrown into a washing machine by a little girl and comes out of the machine as a big ball of fur, was excised. ABC: Cut scenes were as follows: the fur-charring result of a hand grenade explosion on Wile E., who walks into the horizon; Wile E.'s disguising of a shotgun as a peep-show projector, which the Road Runner peers through with excitation but which then blasts Wile E.'s face. Merrie Melodies: The gunshot in the rifle-as-peep-show projector scene was replaced by a still shot of the Road Runner at the edge of a cliff. Nickelodeon: Toward the end of this cartoon, as a line of mice come marching out of the refrigerator carrying food on their heads, they turn into black-stereotype African native safari bearers for a couple of seconds. This was removed from the computer-colorized version. CN: Introductions to some of the gags which show stick figures of Nazi soldiers have been removed. ABC: Scenes cut from this cartoon: Bugs asks, "I don't want to sound nave, Jacque, but what gives you the right to dam up the river?" after which Shellacque points a gun at Bugs and replies, "This gives me the right. Any objections?" and Bugs inquires as to whether Jacque's is a safe dam, and is answered by, "Naturellement. I build him myself." Later, after Bugs directs a stick of dynamite on a tiny raft toward Blacque Jacque's dam and Jacque captures the dynamite in a net and carries it off camera where the explosion occurs, Jacque staggers into view, his features and clothes indicating that he was directly caught in the dynamite detonation. By eliminating this, ABC left the viewer to speculate about the effect of the explosion on Shellacque. WB: Daffy uses a duck call to alert the fox of the female duck (Fudd in disguise) sitting in a lake. The fox grabs the duck (Elmer), starts running, then stops and asks, "What kind of a duck is this?" and opens the top half of the duck. It reveals Elmer, who points his rifle at the fox's face and says, "Muscling in on my territory again, eh?" The fox slams the top of the duck costume back down on Fudd. The cut was from when Daffy alerts the fox with the duck call to the part where Elmer is yelling, "Come back here, you cwazy character!" to the fox. Also affected by the editorial knife was part of the scene wherein Elmer holds the fox at gunpoint. This scene cut from the fox drowning his boat to Elmer saying, "Why, you doggone crook!" to the fox. ABC: The scene in which Elmer shoves a gun down Bugs' throat was eliminated. 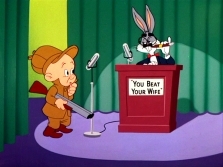 Deleted along with this was Bugs' heckling of Elmer that provoked Elmer to train his gun at Bugs. Elmer: "Hey, pinhead, do you know how to make anti-freeze?" Bugs: "Yeah, hide her nightgown." 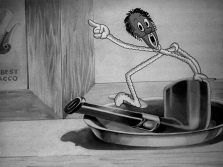 CBS: The anti-freeze joke was untouched, but there was an abrupt cut to remove Bugs whacking Elmer with a mallet and Fudd with the gun menacing Bugs. WB: Same edits as on ABC. CBS: The entire scene with Bugs in the pressure cooker was spliced away from this cartoon. The jump was from Dr. Spots forcing Bugs to enter the hut to Bugs running out of the hut, with the viewer not privy to anything in the interim. 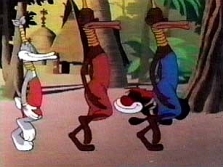 Nickelodeon: Gone was the scene wherein Bugs disguises himself as a Zulu native, stretching his face with plates in his mouth and putting rings around his neck. ABC: Two scenes were cut. One was Wile E. being electrically shocked by the wire on which he was trying to balance his "wheel head". The scene faded to black right before the wire lands on the power lines, thus ending the scene just after Wile E. hits ground from his fall. The other removed scene was where Wile E. tries to drop a barrel rimmed with dynamite upon the Road Runner, only to himself tumble and have the barrel crash on top of him. The edit made it appear that the barrel exploded before falling on Wile E..
CBS: The ending of this cartoon, with the Road Runner pulling the "That's all, Folks!" tag, was deleted. The viewer could see the Road Runner for a fleeting instant coming down the screen before the abrupt fade to black. 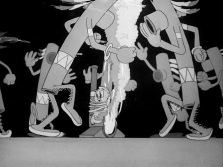 CN: In the redrawn colorized print of this cartoon, the part of the "Little Kids Shouldn't Smoke" song performed by the Cab Calloway caricature is cut. Also removed is the appearance of a tribe of Indian cigars who dance around Porky. 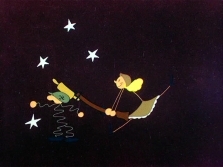 Merrie Melodies: In addition to the Cab Calloway scene, the beginning of the musical sequence during Porky's dream was also removed. In it, four cartoon matches strike themselves and quickly burn out, displaying the traditional blackface features. As they do this, they sing the opening four notes of the song, in the style of The Mills Brothers. Nickelodeon: Same edits as on Merrie Melodies. ABC: The scene in which Hippety Hopper kicks Sylvester in the face several times was shortened. ABC: After Bugs a la Liberace hands to Elmer the dynamited candelabra, the explosion was cut, but, "I did that because I wanted the show to go off with a bang," was left intact. Also cut: Elmer fires his gun at Bugs several times, leaving rabbit-shaped bullet silhouettes in the wall behind Bugs; after Elmer emerges from a re-enactment of "Custer's Last Stand", one only sees the front of him- there was an edit before Fudd turns sideways, revealing several arrows protruding from his rear. CN: The scene wherein Bugs disguises himself as Groucho Marx on the set of "You Beat Your Wife" (a play on Marx's You Bet Your Life) is now edited to remove all references to the fictional television show. The sign displaying the show's title on the podium has now been digitally removed, and some of the conversation between "Groucho" and Elmer is also gone. There is now a abrupt jump from Bugs/"Groucho" saying, "Welcome, welcome..." to him asking Elmer, "What's your name and what do you do?" This is followed by another cut to Elmer stammering and Bugs/"Groucho" leaving the podium. All CN showings prior to 2001 were uncut. WB: In the scene where Bugs dresses as Groucho Marx and interviews Elmer, the dialogue was edited so that all references to "You Beat Your Wife" were gone. Also eliminated was the "Custer's Last Stand" scene. The cuts were efficiently done, but it was still fairly obvious that there were edits, especially in the "You Beat Your Wife" scene. The show sign on the podium was blanked out by a brown square. If one watches closely, the square lightens for a fraction of a second. Syndication: A television station inexplicably cut the shot of the Latin name for the Road Runner. CN: This entire scene is cut: Injun Joe hands his beer to a cowboy while he goes out of the saloon to face Yosemite Sam, and then heard is a gunshot and a body falling to ground. The cowboy in the saloon grins and says, "Yep. I get more free beer this-a-way! Heh, heh, heh!" 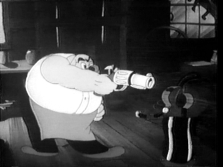 Merrie Melodies: Footage from How Bugs Bunny Won the West, the prime-time television special, was inserted over Bugs pistol shooting at a thrown tin can and discharging the gun into Yosemite Sam's face. Instead of this, Bugs' gun shoots corks to fill the holes in the can left by Sam's earlier target practice with the can as target. WB: In addition to the removing of the Injun Joe scene, Bugs' target practice with his gun firing into Sam's face was also totally eliminated, and the "shoot-out" between Bugs and Sam was cut to remove several more gun blasts in Sam's face. Syndication: Bugs covers Elmer's eyes from behind and plays "Guess Who?". Originally, Elmer's second guess is Carole Lombard. Lombard tragically died in a plane crash in 1942. Out of respect for the late actress and fear that the reference might be in bad taste, her name was overdubbed with Barbara Stanwyck's when this cartoon was reissued as a Blue Ribbon Merrie Melodie. CBS: As Bugs does the, "My, what big eyes you have!" routine with the Big Bad Wolf and pokes Big Bad in the eye, there was a film splice deleting this action. Merrie Melodies: Daffy donning a grey wig, using a cane, and imitating an old slave, saying, "Yessir, massa Elmer," was edited out of this cartoon, which has subsequently been banned outright. Syndication: Daffy hitting Mr. Meek on the head was shortened from five strikes to one, similar to ABC's editing of "Bowery Bugs". ABC: Bugs refers to the Dutch buying Manhattan from the Indians for a song (sheet music), but the viewer did not see an Indian grabbing the sheet music, gleefully scurrying into the distance, and exclaiming, "Me rich Superchief!" CN: The Dutch purchasing Manhattan from the Indians is completely gone as the cartoon is cut from the scene of the Statue of Liberty as a little girl to the Ben Franklin kite-flying scene, with a fake fade-out between the two. WB: Same edit as on CN. 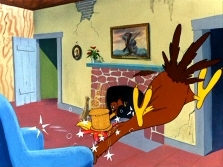 CBS: Henery slamming the door in the path of a fleeing Daffy, who collides with it, was cut out of this cartoon, though the viewer did see Daffy's beak sticking through the other side of the door ("I distinctly said, 'help.'"). Later, George K. Chickenhawk chases Daffy in circles in one door and out of another. A helpful Henery mallets George K. instead of Daffy. The impact of the mallet was deleted, but one still saw a "flattened" George K.
Syndication: According to the book Frank Tashlin by Roger Garcia, "several shots (including a caricature of Hugh Herbert) totaling 67 feet (approx. 45 seconds) were removed for this film's 'Blue Ribbon Special' reissue in 1946." The bulk of these cuts appear to take place primarily towards the beginning of the cartoon, specifically during the montage sequence featuring brouchures of various world destinations accompanied by a song germane to that place. Some of the brouchures are bridged with dissolves, others with fade-outs. Some of the fade-outs, however, appear to allude to obvious edits. Later in the cartoon, another apparent edit occurs. This takes place during the "Yuba Plays the Tuba" sequence in which a shot of a Native American fish (representing the "Indian" Ocean) abruptly fades to black and quickly fades into Lawrence Tibbett in Tibet. 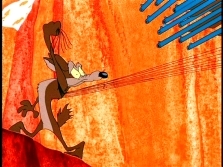 ABC: The scene wherein Wile E. incurs a violent electric shock when his magnet on fishing wire connects by accident with a power line, was shortened. Syndication: Some television prints of this cartoon were without Wile E. being blasted by a row of rifles. 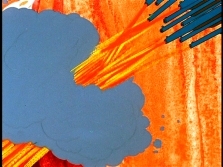 ABC: The scene in which Wile E. finds a duplicate of himself at the end of a brick wall and throws a dynamite stick at his imposter only to blast his own backside, was edited out of this cartoon short. Also removed was Wile E. constructing a ramp with a bomb at its top only to have the bomb explode in the split-second that he lights its fuse. All images © Warner Bros.